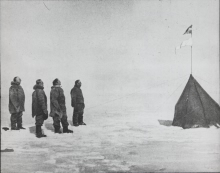 Roald Amundsen, Helmer Hanssen, Sverre Hassel, and Oscar Wisting at the South Pole, December 16, 1911. The photographer was Olav Bjaaland. Amundsen had selected the members of his polar party to ensure that he had at least double coverage of most necessary skills. Each man had designated duties, but there was for each at least one man backing him up in case the man with primary responsibility should become incapacitated. Most teams in problem-solving organizations have only single coverage for critical skills, which Amundsen would have found appalling. Photo courtesy Norwegian-U.S. Scientific Traverse of East Antarctica. One widely used model of human motivation is Abraham Maslow's Hierarchy of Needs, which orders human needs from lowest to highest as survival, security, belonging, and love, self-esteem, and finally self-actualization. According to the model, we focus our attention on the lowest-level unmet need. For instance, fears about safety prevail over any concerns about belonging to the right health club. In problem-solving organizations, the lowest level needs that come into play are the social needs, including belonging. At home, belonging means a loving family, friends, and a social network. At work, belonging means friendship, respect, and acknowledgment. Belonging is fundamental to self-esteem, and hence to high performance and self-actualization. When policies, decisions, assignments, and evaluations threaten people's sense of belonging, we threaten their self-esteem and depress performance. After we remove someone's sense of belonging, high performance is not possible for long. In effect, when we hold out belonging — friendship, respect, acknowledgement, and inclusion — as a reward for performance, we cause an inversion in the Maslow Hierarchy of Needs. It's a Catch-22: for humans, belonging is a prerequisite for high performance, but in many workplaces, belonging must be earned by first demonstrating high performance. When we invert the order of Maslow's hierarchy, we risk a variety of troubles. For example, when we devise team assignments, we tend to focus on team needs and member capabilities. We assign some people with rare capabilities to multiple teams, switching them from team to team as the work requires. Often, the unintended message to those who remain assigned to a single team is that those with rare capability are more valued — they belong not to the team, but to an elite group. Those who stay put can thus actually feel excluded from the elite. Their need to belong is unmet, which can erode self-esteem, and that affects their performance. Ironically, by using split assignments to optimize team performance, we erode the performance of those whose assignments are not split. of troublessplit assignments foster elitism and exclusion. Although the performance of the few might be high, the performance of the many can decline. We reduce the need for split assignments. We eliminate bottlenecks because more people can carry out a wider array of responsibilities. We build stronger relationships between the most expert and the least expert. We mitigate the risks of losing rare expertise to voluntary termination, illness, or accident. For an examination of the effect of Maslow Hierarchy inversions in the educational system, see The Need to Belong: Rediscovering Maslow's Hierarchy of Needs by Norman Kunc in: Villa, R., Thousand, J., Stainback, W. & Stainback, S. Restructuring for Caring & Effective Education. Baltimore: Paul Brookes, 1992. Would you like to see your comments posted here? rbrenJgHfuTHzDRCKTqRyner@ChacNmTeqiTmWbRBYvKxoCanyon.comSend me your comments by email, or by Web form. I offer email and telephone coaching at both corporate and individual rates. Contact Rick for details at rbrenMIYZEnbQAjHQGgDdner@ChacWXWwgzgDzYgiESqfoCanyon.com or (650) 787-6475, or toll-free in the continental US at (866) 378-5470.